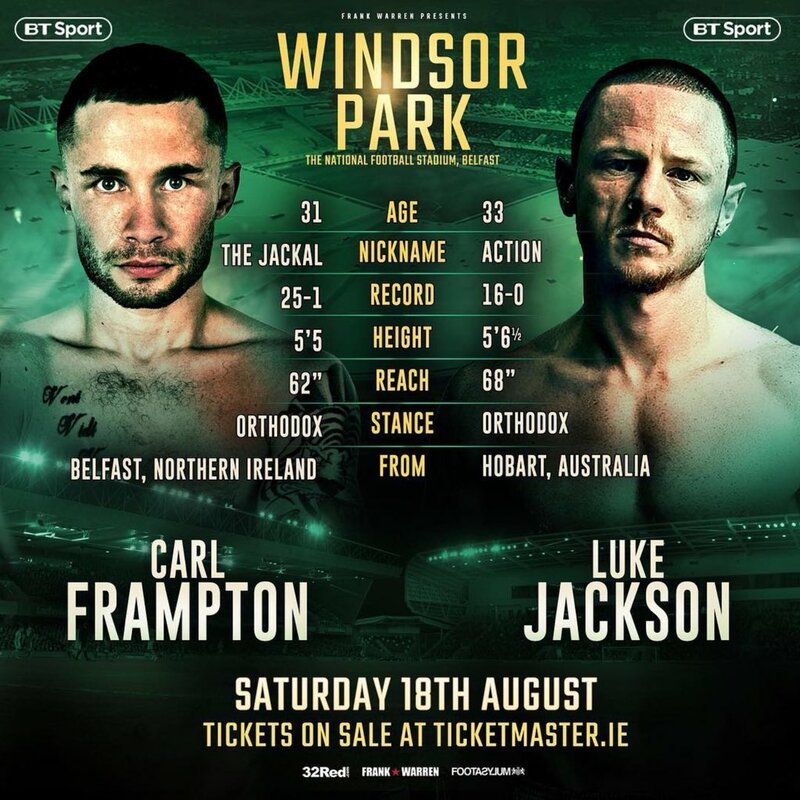 Less than a week out from his fight against Australia’s Luke Jackson 16-0 (7) at Windsor Park interim WBO featherweight champion Carl “The Jackal” Frampton 25-1 (14) is already looking ahead to high profile fights against IBF titleholder Josh Warrington, WBO boss Oscar Valdez and old foe Leo Santa Cruz, who he split a pair of fights with in 2016-17. “This is the most excited I’ve ever been for any fight, even though there’s not a world title on the line and who knows it could be the one and only time I get to fight at Windsor – and it may end up being the last time I fight in Belfast,” said the 31-year-old to the Belfast Telegraph. Also appearing on the Windsor Park bill will be lineal heavyweight champion Tyson Fury up against former world title challenger Francesco Pianeta and Paddy “The Leprechaun” Barnes challenging for a world title in just his sixth pro bout against WBC flyweight champion Cristofer Rosales. Frampton is hoping to create a memorable event that is still being discussed generations later. “I hope that in 40 years’ time people will look back at the night I gave one of my best performances, Paddy became a world champion and big Fury had his last fight before going on to be world champion again. “For me personally it is going to be a special moment to walk out into the arena with the green shirt on and soak up the atmosphere that I have often enjoyed when sitting in the stands supporting Northern Ireland. Frampton will be under pressure from the expected crowd of 25,000 fans to deliver a spectacular win, but there will be one person in the crowd he will be looking to impress the most. “I can’t afford to let myself down, my family down or the fans who have supported me so well. They deserve to see me at my very best, going out there and delivering a spectacular win,” said Frampton. “I want to make people feel proud. I know how much it means to someone like my dad. He doesn’t say too much but watching me emerge from the tunnel at Windsor is going to be great for him.